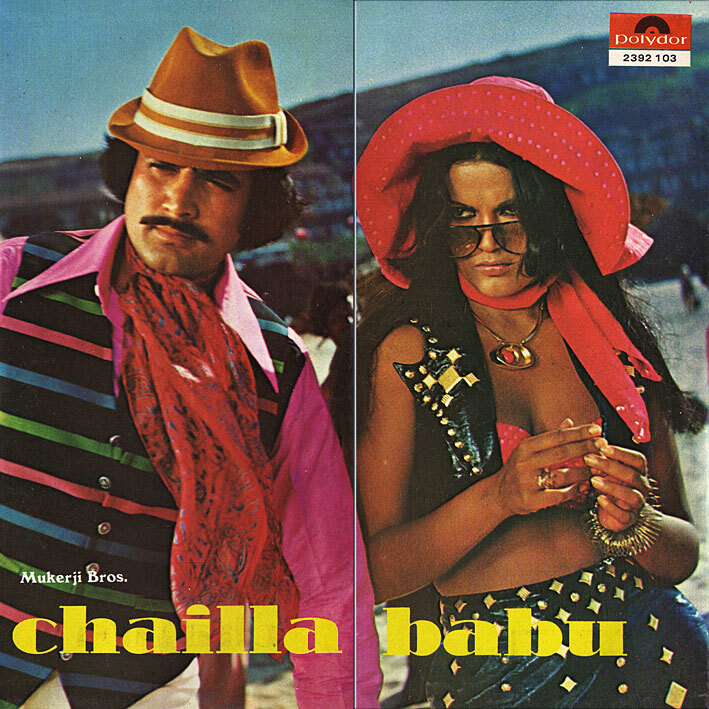 By popular demand (3 requests anyway, which is something of a record), and as the film was reviewed recently at MemsaabStory, here's 'Chailla Babu'. Three top tracks: 'Taxi-Kal Raat Sadak Pe Ek Ladk' has a great fuzzy intro, groovy beat, whoops, giggles, and soaring melody. 'Chailla Mera Chailla' is a lovely mid-tempoed Lata showcase, and 'Yaar Dildar Tujhe Kaisa Chahiye' has heavy drums, cool horns and some fun/silly breaks. Sadly, the album doesn't include the opening music linked to in Memsaab's review. Nor Charanjit Singh's instrumental version of 'Yaar Dildar...' as featured on the first 'Bombay Connection' set. Still, quite good fun, but as is not the most essential soundtrack LP I know of. Ooo, you're a peach! Thank you! I can send you the intro music if you like, I loved it enough to just rip it off the DVD although I'm not much of a sound engineer so it isn't crystal clear. I love the music throughout the film, lots of funky background music. Too bad OSTs never seem to care much about that stuff! This is special! Laxmikant Pyarelal's arangement especially in Kal Raat Sadak Par is mindblasting. Simply Superb! I thought I saw SATYAM SHIVAM SUNDARAM on your blog somewhere ( or is it just my confusion ). I am looking for it. Do you have it? Would you happen to have a copy the of "Dance Dance" soundtrack with Mithun Chakraborty? Although not the best, it has some great catchy tunes. Many thanks for all the excellent work as well. eXCellent Post ,appreciate your efforts PC ,but the link is dead ,thankfull if you upload again. Thanks santosh. As a rule, the albums last as long as they do; once they're gone, they're gone - I can't keep re-uploading for ever. I'll see if I can locate this one again, but chances are it's on a back-up server and not easily accessible on my laptop. But should anyone who's downloaded it earlier feel like re-upping and posting a link, feel free.